Here’s the third and final entry in the series of graphics I’ve produced for my Pint of Science event at La Raza, Cambridge (UK). 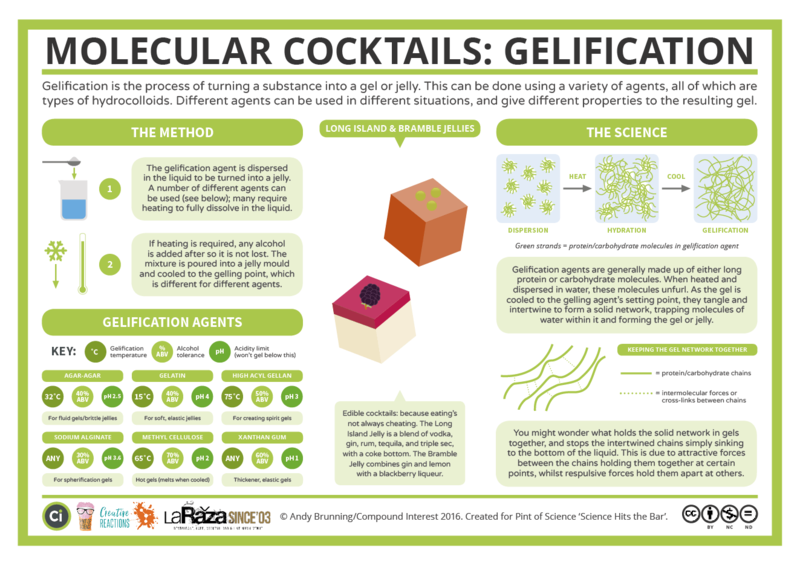 Today’s graphic looks at how chemistry can help to turn cocktails into jellies, and some of the different chemical agents that can be used. Unfortunately, the Pint of Science event itself is now sold out, but I’m sharing the graphics here, and there’ll also be more detailed posts to go with them after the event has happened! If you missed the earlier graphics, catch the post on foams here, and the post on spherification techniques here. [Edit 27/05/2016: More detailed post now below!]. Making jelly is something a large number of us have probably done before – however, making it from cocktails is much more fun! To do it, all you need is a gelling agent, heat, and a fridge. There are a number of gelling agents you can use, and which you plump for will depend on the properties you want your jelly to have (which we’ll discuss in due course). Most jellies will probably use either gelatine or agar, however. Making the jelly is pretty simple. All you have to do is dissolve your gelling agent into your cocktail mixture – not that some gelling agents require heat to dissolve fully. Once you’ve done that, you simply need to pour the mixture in a mould, then chill it so that the jelly can set. 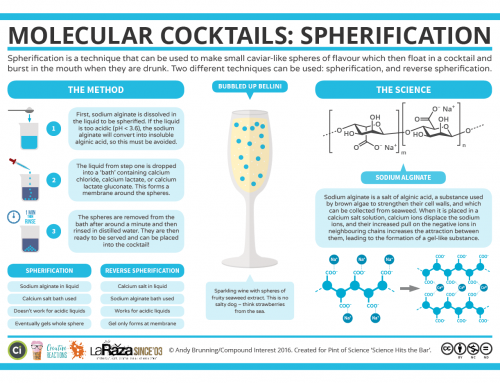 What’s going on at the molecular level to turn our cocktail into a jelly? Firstly, you can imagine our gelling agents as long, tangled molecules, kind of like coiled up, knotted snakes. When we mix them into our cocktail mixture, these clumped tangles of molecules start to unfurl, until a multitude of them stretch across our cocktail mixture. When the mixture is chilled, these molecules tangle around each other, forming a molecular net that we refer to as the gel network. This gel network traps water molecules, turning our cocktail from a liquid into a jelly. Depending on the type of jelly you want to make, different gelling agents can be used. As shown in the graphic, some agents are more tolerant of more acidic conditions, whereas other can cope better with higher alcohol content (useful for spirit jellies, or even flaming alcohol jellies!). Another gelling agent, methyl cellulose, has the weird property of being a gel when hot, but not when cooled – the opposite of most other gelling agents. This is because at cooler temperatures, water molecules can form clusters around the methyl cellulose molecules, preventing them from cross linking and forming a gel. At higher temperatures, these water clusters are removed, allowing a jelly to form. Gelling agents can also affect the appearance and texture of our jellies. The amount of gelling agent used will dictate whether our jelly is soft and yielding to the touch, or hard and solid. The type of agent also affects the elasticity of the jelly; agents that form stronger gel networks are more elastic and springy, whereas those that form a weaker gel network are more brittle. If you’ve ever tried to make fruit jellies, you might well be aware that not all fruits are up to the task. Pineapple, papaya, and kiwi are all impossible to make jelly out of if you’re using the raw fruits. This is because they all contain enzymes that are capable of breaking up gelling agents, and stopping the gel network from forming. You can still make pineapple, kiwi, and papaya-flavoured jelly, but you’ll need to use fruit that has been cooked (or tinned fruit) as this denatures the enzymes and prevents them from interfering with the gel network. The good news is that, pineapples etc aside, it’s hard to go drastically wrong with gelling agents – so why not give it a go?